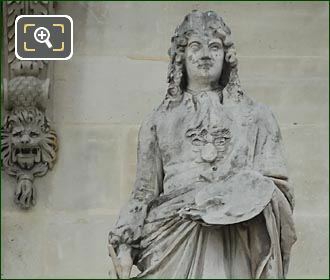 Again we were admiring the wing of the Musee du Louvre called the Aile en retour Mollien, which faces into the Cour Napoleon courtyard in the 1st Arrondissement, when we took these high definition photos showing a statue of Charles le Brun by Jean Claude Petit. So this stone statue of Charles le Brun is located on the first level balustrade of the Aile en retour Mollien, and is the third one from the left hand side of the facade, and produced by the French sculptor Jean Claude Petit, this was put in place in 1857 with the other additional embellishments and famous men sculpted specifically for the former Palais du Louvre. 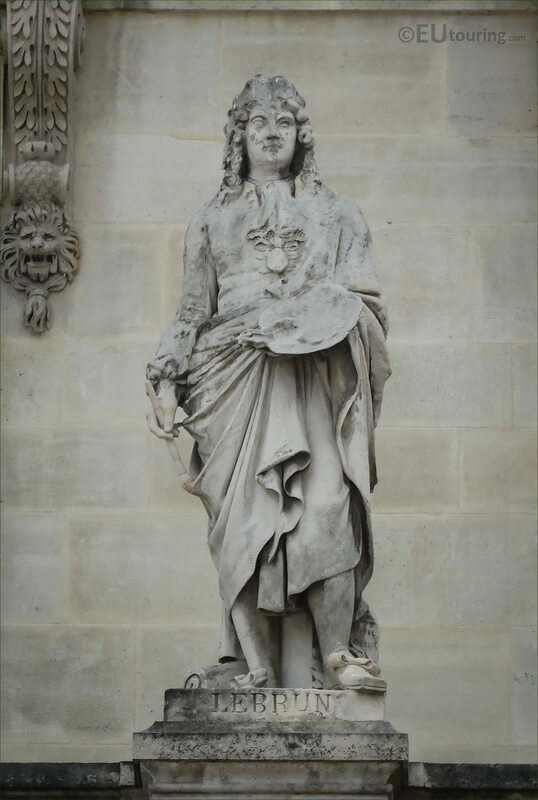 This next HD photo shows a closer view of the statue depicting Charles le Brun, who was born in Paris in February 1619 and at age 11 he first got noticed for his talents as a painter, and by 15 he was receiving commissions from Cardinal Richelieu, prior to then accompanying Nicolas Poussin to Rome where he studied under him for four years before returning to Paris. Now as you can see in this image, sometimes his name is shown as all one word, yet he is most well known as Charles le Brun, rather than Lebrun, and back in Paris he became the director of the Gobelins, which was a manufacturer for furniture and tapestries for the royal palaces, and he was the originator of Louis XIV Style. 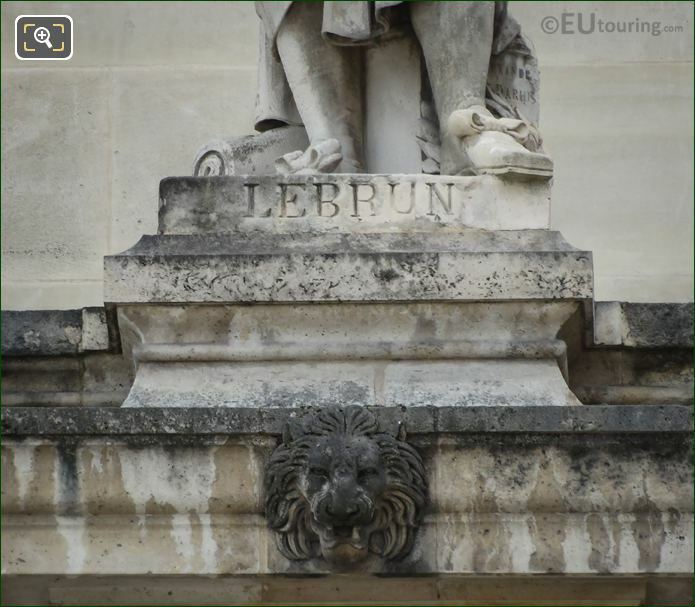 Also, the King had much admiration for him, and he received a title and income for being The first painter of the King. 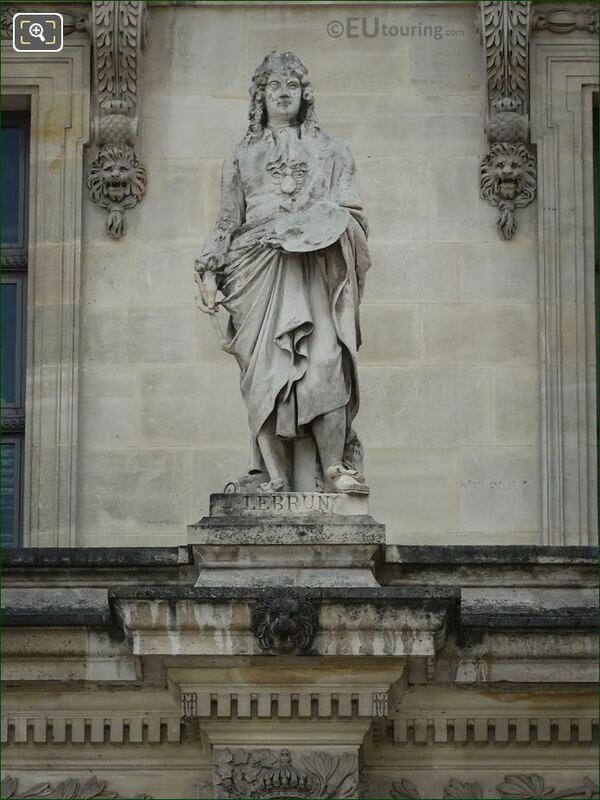 And from 1662 all paintings etc in the royal palaces was directed by Le Brun, yet he still executed specific decorations himself, including several for the Chateau de Versailles like the Great Hall of Mirrors and he primarily worked for King Louis XIV on different paintings and decorations, many of which are now at the Musee du Louvre.